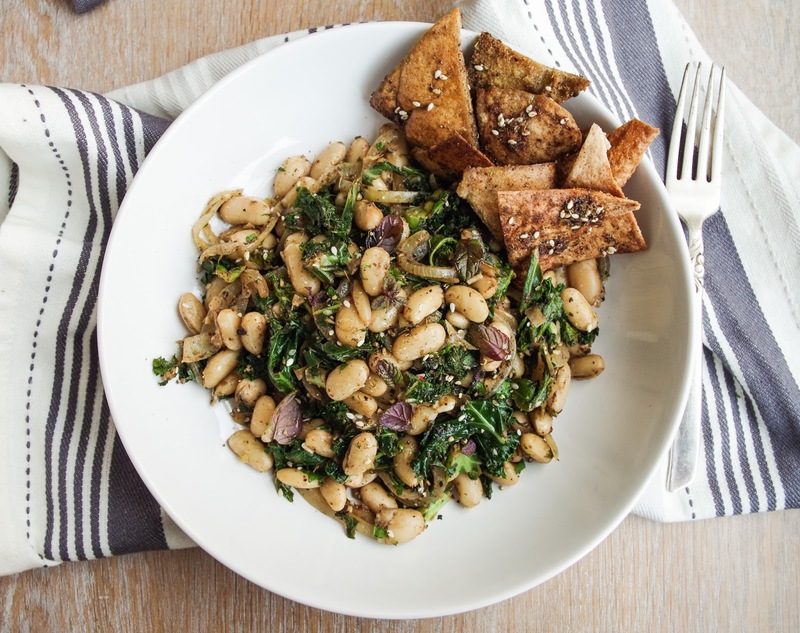 Sometimes you need a meal that’s just as nutritious and easy as it is hearty and delicious – this next recipe checks all those boxes and it can be made in less than 30 minutes. 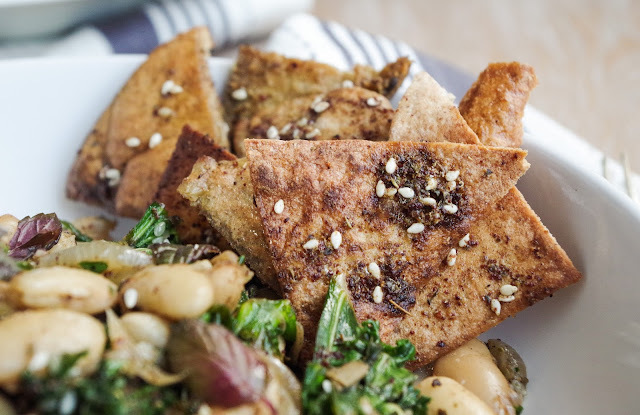 Here I combined white beans and kale with softened onions, garlic and seasonings, which I paired with some home-made pita chips, all golden, crisp and coated in Za'atar spice. Za'atar is a middle eastern spice mix, predominantly consisting of sumac, sesame seeds, oregano and salt – however it varies from region to region. It’s tangy, fragrant and always so delicious. I used the za'atar in this recipe to coat the pita chips and in the beans and greens – which adds such depth of flavour to the dish in relatively little time. This next recipe is also so good for you, with a balance of protein, carbohydrates and fats, along with a whole range of vitamins and minerals. The beans provide protein, fibre, iron, manganese. 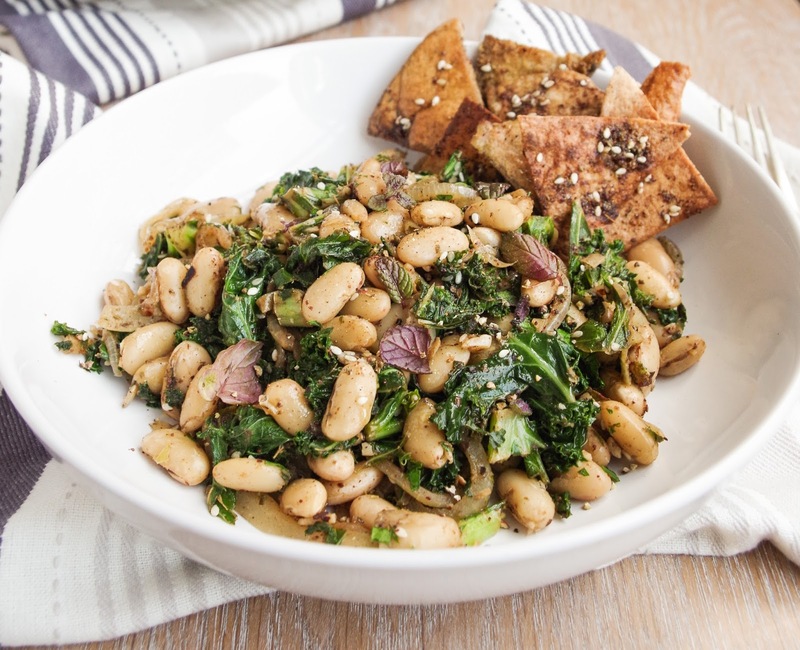 The kale contributes vitamin K, iron, vitamin A and C, which aids iron absorption and the good fats from the olive oil allow for absorption of fat soluble vitamins A, E and K. Not to mention the pita chips which are made from wholemeal pita breads – so provide a good amount of fibre, along with some protein too, which will help to stop your blood sugar levels from spiking and keep you fuller for longer! 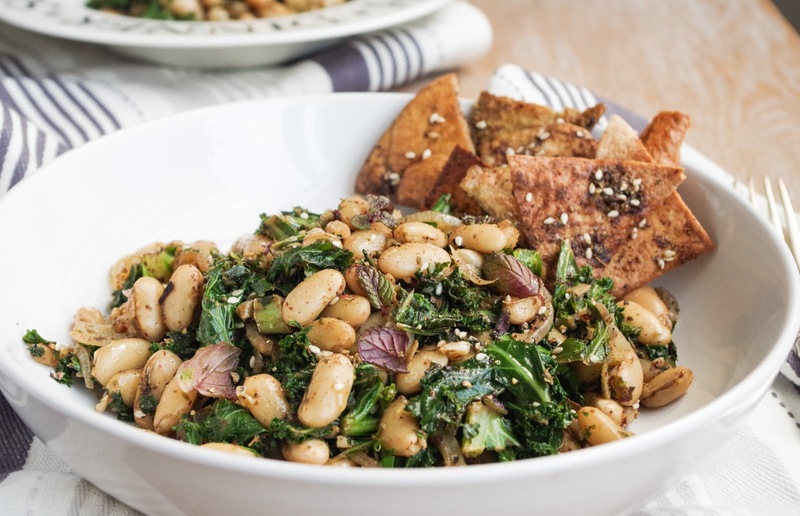 I used white beans and kale in this dish – but other legumes like chickpeas or lentils and other greens such as spring greens or chard would also work well and have similar nutritional profiles. This versatile recipe can also be eaten both warm and cold, as a side or a main dish. Pre-heat the oven to 200°C and line a baking tray with grease-proof paper. Chop the onion in half, remove the skin and slice thinly. Fry on a medium heat for 5-10 minutes until it has softened and translucent. Then crush the garlic and add this to the pan along with the beans. Keep stirring and cook for 5 more minutes. Meanwhile, cut each pita into 8 triangles and then separate the halves, so you have 16 triangles from each pita. Combine the za'atar, garlic, salt and oil in a mixing bowl and then coat each triangle in the mix, you may need to spoon some of the paste onto each pita chip. Spread out on a baking tray and cook for 5-10 minutes. Keep a close eye on them as they can burn easily. Add the seasonings, kale, lemon juice and vinegar to the pan and heat through until the kale has wilted. Taste and adjust seasonings if necessary, then serve up and enjoy!